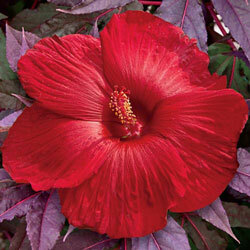 Thick, leathery foliage of deep wine-purple supports black-red buds that open into 8-9" scarlet red flowers. Its compact habit lends itself to nearly any garden space or container. Indeterminate variety produces multiple buds on each stem! Foliage Type: Deep Burgundy lance shaped leaves. Flower Form: 8-9'' Cup shaped flowers. Petals overlap each other on 1 side. Soil Requirements: Moist, well drained soil. Pruning: Can deadhead to improve the appearance of the plant.